After reading Part 1 and Part 2, you should be completely prepared now for your pups' arrival in Germany. But, you may still have nerves about how it's actually going to go at the airport. So, I thought you'd like to know how our experience went, what we did to prepare, and how our dogs fared. Our flight was in the evening so we fed the dogs early in the morning and gave them plenty of water until it was time to leave for the airport. We made sure to take them out right before we left. Our rental wasn't large enough to fit all of our suitcases along with two assembled dog crates so we just decided to leave them unassembled/stacked and to assemble them once we got to the airport. Remember to factor this into how you'll be getting to the airport and leave time! We fed them far before they'd be on the flight, let them potty twice before we left for the airport, and then let them potty again right before we checked in for our flight. Assembling our 'Sky Kennels' didn't take long, it was quite easy to simply align the top and bottom pieces together and screw the metal bolts/nuts together. Bring a wrench to make sure everything is tight! Wouldn't want your pups getting loose for any reason during this process. I would say about 15 minutes to assemble each crate with two people is plenty. *Oh also, if your pup gets cold easily, buy them a little sweater to wear. I hear it can get cold in the cargo. Both of our pups like the cold so we let them be. After you have your dogs in the crates, walk over to the check-in counter for your airline and check-in as usual. They'll do all of the usual first (like checking in luggage and such) before getting to the dogs. 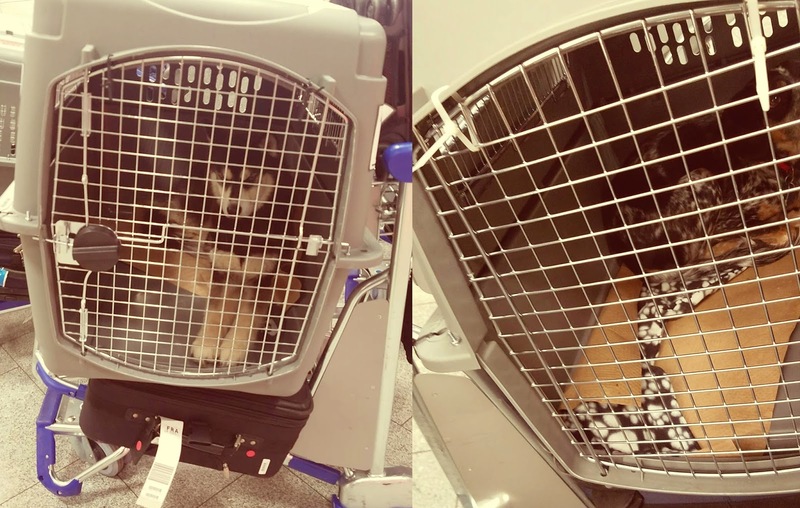 *Not dog related but... - We flew with Lufthansa who surprisingly, weighed our carry-on luggage. My husband has flown overseas plenty of times before, and he said he had never had his carry-on weighed before. So watch out! Now they'll ask for the paperwork. The airline didn't take too long to look over it. They simply called over their supervisor who made sure that we had all of the forms and that it matched the APHIS Form 7001. After checking you/luggage in and looking over your paperwork, they'll ask you to go down to the end of the counter where they'll make sure that your kennels meet IATA requirements. They'll put a bunch of stickers on the kennel like a flight tag and some arrows/live animal stickers. Once they clear that your dogs are ready for the flight, they'll ask you to pay for the dogs. I think they mentioned normally, we would pay after TSA approved us, but that they may take a while and it looked like we would be fine. Your airline should post the prices of your dog's flight (by size) online so you should already be aware of how much it will cost, but we were surprised that Lufthansa charged us $400 for our Husky and $300 for our Bluetick. Our Bluetick was too big for the small size ($200) and too small for the medium ($400) which may be why they charged us an intermedian price (or it may have been that TSA kept us waiting so long they felt bad?). We're not sure, but you can always ask nicely about a possible discount if your dog seems to fit between sizes. ***Key word: nicely. I worked in customer service for years. Reps are much more likely to help you if you're nice. They're not required to offer you a discount like they did with us. Now this is what may take awhile. This should all depend on when your flight is/the airport. We had to wait for a little longer than 30 minutes for the TSA to arrive. As you can imagine, this made us a little bit nervous with a flight to catch, but Lufthansa was very politely apologetic about the situation and assured us that the flight would be held for us if TSA were to take longer. Thankfully, they didn't. Once TSA arrived, they checked that the crate met IATA regulations again and that all openings were secure. They also had to pat down the puppies (are they checking for drugs?) and check that there was nothing in the crate other than absorbent paper. They then asked us if they would be needing food. We said no as the flight isn't very long (8 hours), and it was direct so there would be no worries of something going wrong. They advised us to leave the hanging water bowl (came with the kennel) latched onto the inside of the door just in case there was a delay, and somebody needed to provide them with water. Then, they ziptied the kennel door to the plastic for extra security and were carried off on a large trolley. YOU MADE IT TO GERMANY! Worried about the pups? Run to pick up your luggage! You will find your puppies where you pick up 'Oversized Luggage' (usually off to the side where you normally pick up the rest of your luggage). Our puppies seemed surprisingly relaxed, and they had not pottied in their crates! Who wants to lie for hours in pee/poo? Even dogs don't like that. Got all of your luggage? Now you can just follow the signs to Customs/Border Control. It was my first time in the EU and outside of the US since very little so it was really cool to see the Customs here (not sure if it's different at the other airports, we flew into Frankfurt). Got to see some APC (Automated Passport Control) kiosks! 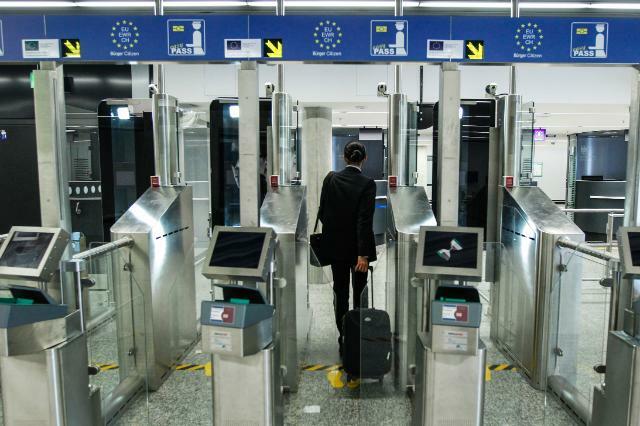 If you're new to this like I was, you could go to the left if you're an EU Passport owner and use the kiosks to scan yourself through for a quicker process. As Non-EU Passport holders, we went to the right through a normal line to talk to the Customs officer. The APC kiosks for EU Passport Holders! He asked us the usual questions like why we were here and how long we'd be staying, etc, but not one question about the dogs. 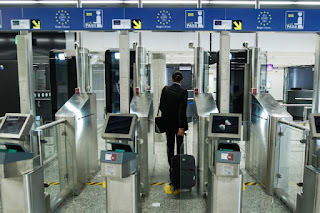 It being my first experience, I expected going through Customs to be much more of an ordeal, but it was just a couple of questions, showing him a form or two, and then being cleared to enter. Nothing about the dogs! Puzzled when he said we were clear, my husband and I asked him if we needed to do anything additional for the dogs. He mumbled something about maybe later on, just that he doesn't handle that. So we assumed there was somewhere we'd have to stop by later to 'check in' the dogs. We kept walking and it just spit us out into the pickup/dropoff lobbies. Nobody stopped us for the dogs nor were there signs anywhere on what to do for the dogs. We didn't see anybody around that we could ask either. As you can imagine, we were quite confused! My husband found a little kiosk window that said Customs so he went to ask about the dogs there, and she said no, they were just the parcel at the airport. So after looking around and seeing nothing, we decided that we could probably just go! First thing we did was let the pups out for some water and then took them outside for a walk. I found an area that was quiet with a small patch of grass/gravel, and they were able to potty. Then we were waiting around for our rental car when somebody who appeared to be security stopped to ask us if we needed water for our dogs. We said we had already given them some, but he seemed to be fond of dogs so he struck up a conversation. We finally happened to just ask, "Are we supposed to stop by anywhere for the dogs? Customs didn't check their paperwork when we entered." He then asked us if we came from the US, we said yes, and he said that was why they didn't check the dogs. He asked if we had our paperwork checked before coming to Germany, and let us know that's all they do for dogs coming from the US. If we had been from some other country known for their issues with vaccinations, their vetting probably would have been much more thorough. Relieved that there was nothing more to do at the airport, we finally started our journey into Germany! Overall, it was nowhere near as complicated as we thought the airport process would be. Now, you're not completely finished with the pups. You'll have to register them with the city once you find a residence, but that's for a later post! Subscribe so you don't miss this information!